Calling all pumpkin lovers…. drop that pumpkin spice latte (for real, do you know what’s in that cup?!) and listen up. Do you want a real pumpkin fix? You see, there’s a big difference between “pumpkin-flavored” and the real deal. So this week I’m sharing my all time favorite pumpkin recipes and treats made with real pumpkin. And of course everything is full of other nutritious ingredients to do your body good this fall. All you have to do is go “like” the meggsalad page on Facebook to get a recipe a day in your feed. Click here to go there now. 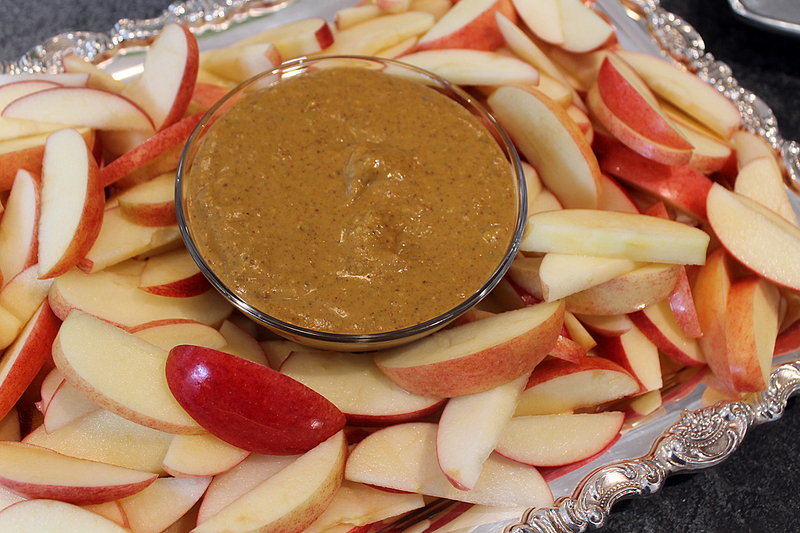 First up is total crowd pleaser – serve this pumpkin almond butter dip as an appetizer or dessert, or make a bunch and store it in the fridge for the perfect after school snack. It sure beats that caramel dip that’s loaded with sugar and God knows what else. With this you get nutrition in your treat. – protein and calcium from the almond butter and almond milk, and a healthy dose of magnesium, zinc, vitamin A and vitamin C from beta-carotene rich pumpkin. Pumpkins are also full of fiber and are anti-inflammatory. See what I mean… real deal. So don’t forget, get on over to the meggsalad page and click “like” or “follow” (whichever one it is…) so you can get four more real pumpkin recipes like this one this week. What are you waiting for? Go get that pumpkin now. Combine all ingredients in a small sauce pan over medium heat. Stir until everything is well combined. Allow the mixture to come to a light boil and then reduce heat and simmer about five minutes. Can be served immediately as a warm spread, or chilled in the fridge and served cool.